Shirts With Random Triangles: 2016 New Mexico Bowl sees New Mexico facing UTSA. 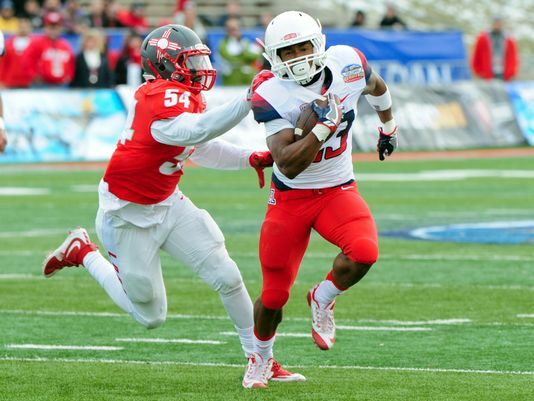 Arizona vs. New Mexico in 2015 New Mexico Bowl. Image via USA Today. History will be made at the 2016 New Mexico. That's because it marks the first-ever bowl appearance of Texas-San Antonio (UTSA). Hey, everybody's got to start somewhere. New Mexico, on the other hand, is no stranger to the New Mexico Bowl. 2016 will mark The Lobos' fourth appearance in the bowl that's played on its home field of University Stadium in Albuquerque, NM. It that doesn't qualify for a dubious achievement nomination for the 2016 bowl season, then nothing will. The New Mexico Bowl will kick off the 2016 bowl season, which at least give you something to watch while trying to avoid any thorny political or personal discussions that might develop at whatever seasonal gathering you might find yourself attending.